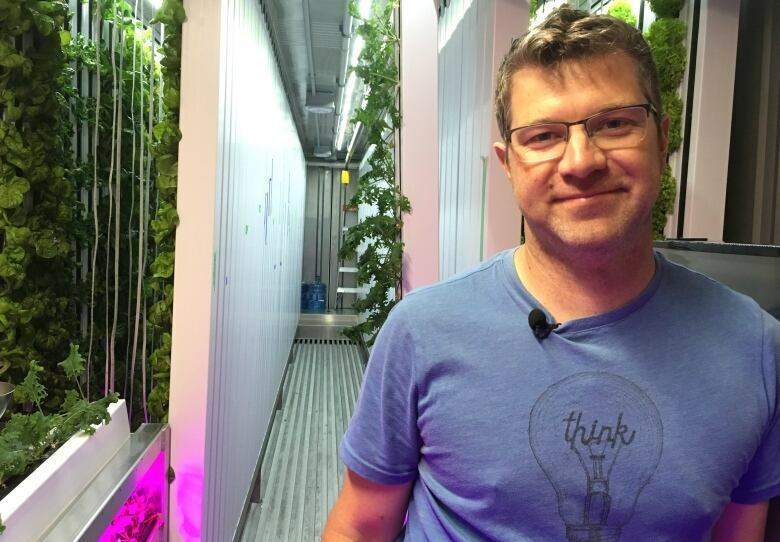 A 12-metre shipping container that once sent goods overseas is now an urban farm on the Dartmouth waterfront that's feeding customers closer to home. Very Local Greens planted itself in a large parking lot across the street from the King's Wharf development. The industrial location is in stark contrast to what's inside — a tiny, high-tech farm teeming with life. "The container can essentially hold the same amount of leafy greens as would a traditional two-acre farm," said Phil Hatcher, who founded what he believes to be Nova Scotia's first freight farm this spring. "We can grow from – 50 C to plus 50 C," said Hatcher. "It doesn't really matter, and that's definitely the goal, is to kind of ramp up for the fall and go right through the winter." Step inside the container and you'll hear the gentle whir of fans and smell an earthy mix of cilantro, basil and kale. There's room for about 5,000 plants, said Hatcher, all grown using hydroponics, so there's no soil, just water. The plants grow sideways out of slim columns that hang from the ceiling. 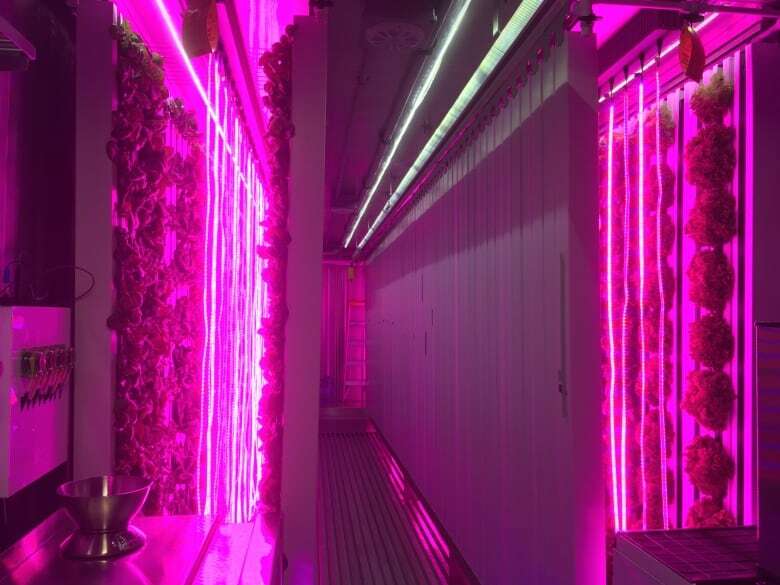 Between the columns are LED lights, which when turned on make the space feel more like a nightclub than a farm. Hatcher said the operation uses about 95 per cent less water than a traditional farm. "We reclaim all of our water from our air conditioning and we reclaim all of our water from our dehumidifier, so we're actually producing more water than we need right now," he said. Hatcher doesn't have a background in farming. In fact, he spent 15 years working in the film industry before making a drastic career change and buying a shipping container. 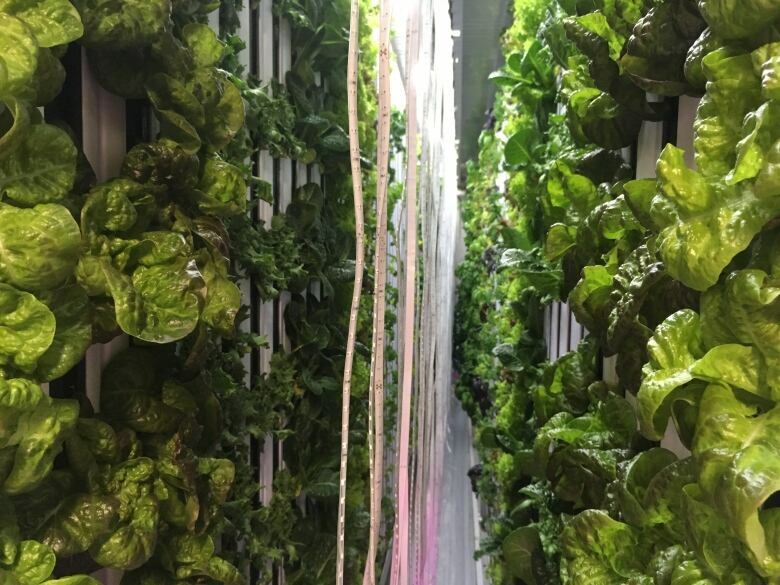 It cost about $150,000 to set up the operation thanks to Freight Farms, a Boston-based business that started manufacturing and selling the units in 2010. One of the selling points is the farmer's ability to control everything — from lighting to nutrient levels — remotely from a cellphone. "Yes, it's high-tech in the way that it's computer controlled and the sensors are all reading different things and crunching numbers, but at the same time it's pumps and it's water and it's tanks and it's air and it's light," said Hatcher. 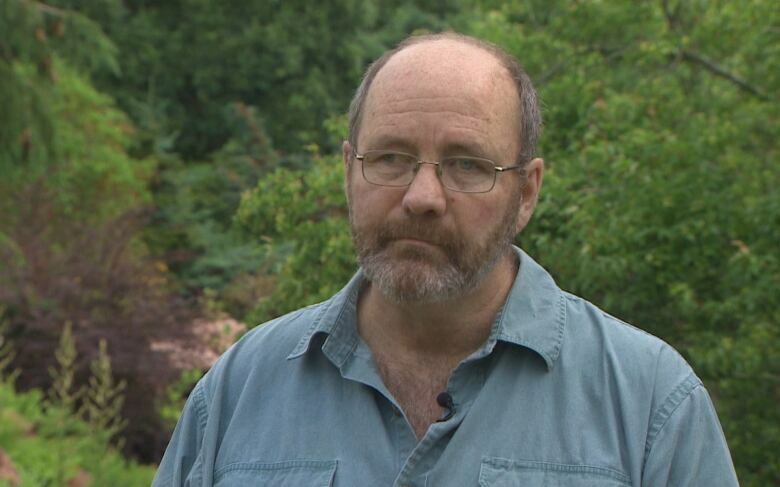 Robert France, a professor in the faculty of agriculture at Dalhousie University, said one of the major hurdles for urban agriculture is lack of space. "The advantage of having various containers are that you can just pick up your production system and move it somewhere else should another use come in to dictate the previous site you were in," said France, who co-edited a book on urban agriculture. 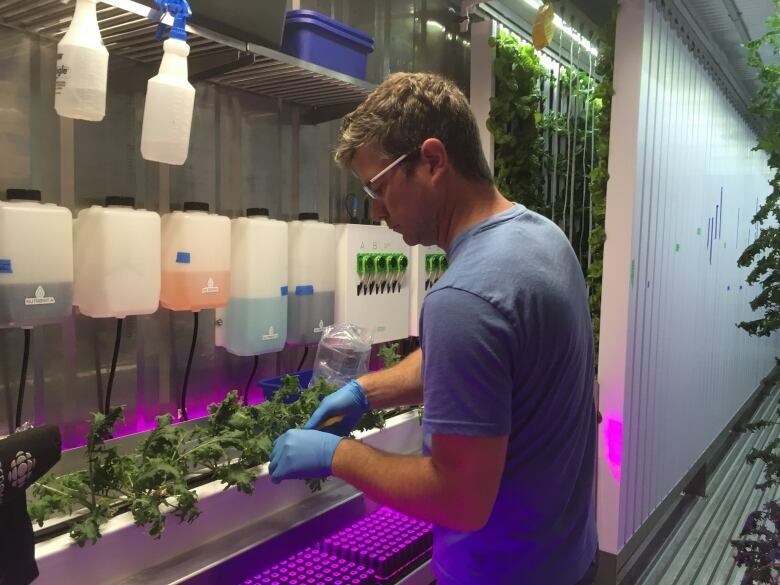 He said farms like this have been able to take off thanks to two major developments in the last five years — LED lights and hydroponics. He teaches an online course on urban farming, and says it's attracting people like Hatcher, who've become disillusioned with their first careers and are looking for a sustainable way to grow their own food. 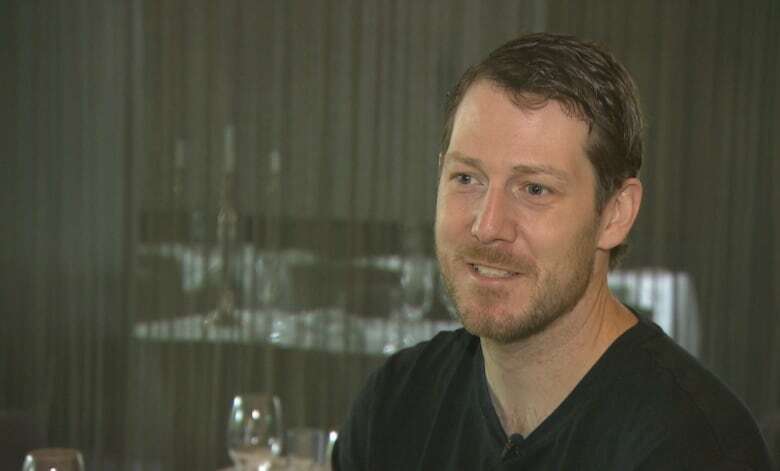 People like chef Dwayne MacLeod are benefiting from the trend. He's one of Hatcher's first customers. He can practically see the farm from his restaurant, Cut Steakhouse, on Lower Water Street in Halifax. He said in the past, finding produce that's harvested the same day was a challenge. Now, he just has to drive across the bridge. He's been working with Hatcher to get some of his favourite plants in the farm's growing rotation. MacLeod said greens grown in containers have a stronger flavour and are also more delicate. "It's a very interesting contrast between the two of them and I find the shelf life on these products probably three times longer than any I've used previously and the yield you get out of it is just phenomenal," MacLeod said. 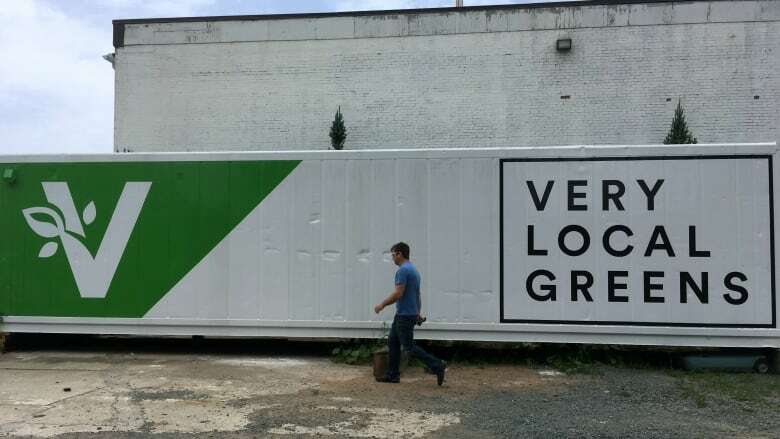 Right now, Very Local Greens is a one-man, one-shipping-container operation, but Hatcher plans to hire staff later this summer. And if all goes well, he hopes to add a second shipping container to his fleet soon. "I don't think people realize how easy it can be," said Hatcher. "It's a lot of fun so I think anybody who's thinking of hobby urban farming should go for it."